The phenotype of an individual is determined by his or her genotype. 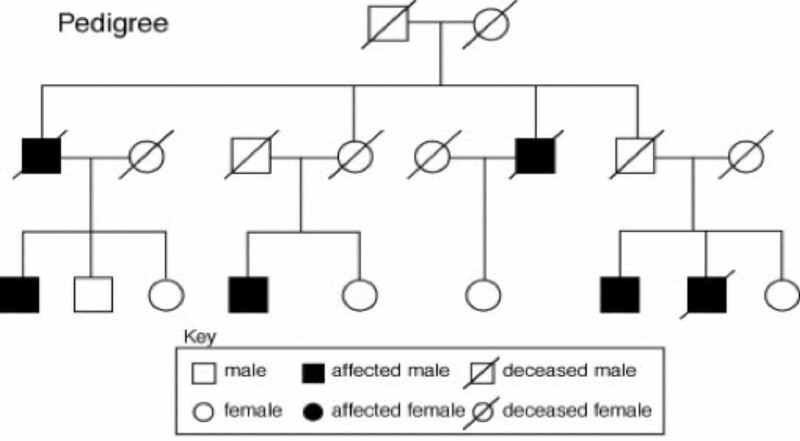 The genotype is determined by alleles that are received from the individual’s parents (one from Mom and one from Dad). These alleles control if a trait is “dominant” or “recessive”. Additionally, the location of the alleles in the genome determine if a trait is “autosomal” or “X-linked”. Traits are dominant if only one copy of the allele is required for expression of the trait. Traits are recessive if two copies of an allele are required for expression of the trait. X-linked traits are those controlled by an allele that is carried on the X chromosome, while autosomal traits are controlled by alleles located on any chromosome excluding the X or Y. Expression of X-linked traits depends on a number of factors including a dominant versus recessive allele, and the gender of the offspring. One can determine the likelihood of producing a child with a particular trait using a Punnett square. 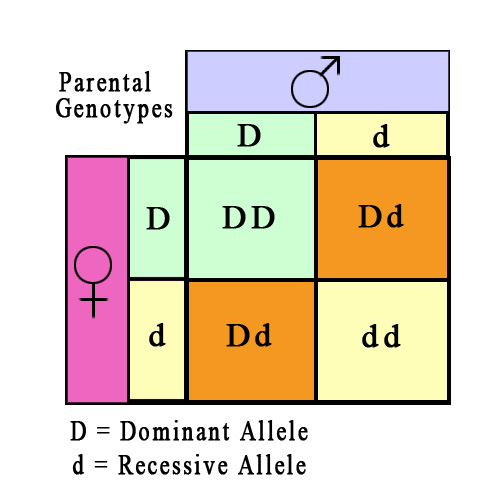 Assuming two individuals know their genotype for the trait, using a Punnett square allows them to visualize the potential genotypes of their offspring as well as determine the likelihood of trait expression. While Punnett squares provide information about offspring, pedigrees are diagrams that allow individuals to visualize patterns of inheritance throughout their family history. Pedigrees utilize symbols to denote individuals in a family. Squares represent males, and circles represent females. Shading implies that a particular individual has the trait that is being studied in the pedigree. A diagonal line through an individual means that family member is deceased. A horizontal line connecting two individuals indicates a mating, and the parallel branched line below the couple indicates their offspring. To the right is a pedigree representing three generations.